My first assumption was that a modern Team site URL would use /teams and a modern Communication site would use /sites. But that’s not the case. Thanks to a drop down box in the SharePoint Admin Center Settings, the URL for the new site will contain “/sites” or “/teams", with the former being the default option. This means you can have a modern Team site with an Office 365 Group at https://mytenant.sharepoint.com/sites/example. So how can site creators choose /sites or /teams without giving them permission to the SharePoint Admin Center? They can’t. However, they can fill out a custom form, which can be connected to the See other options link when creating a Communication or Team Site. Second, create a form. Where? Using what? Since I could not find a definitive answer, I created a form in Microsoft Forms. Unfortunately, when I clicked See other options, I was taken to a Forms page with the error “This form doesn’t exist.” Long story short, a Microsoft Forms form will not work. 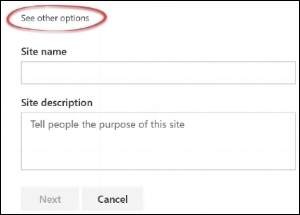 If you want the See other options link to go directly to the page for creating a new item in the SharePoint list, be sure to change the URL ending from /allitems.aspx to /newform.aspx . Finally, it’s time to create a new site! If you are the SharePoint Admin, you can create a new site from the new SharePoint Admin Center. Click “Active Sites” and then simply click “Create Site.” To navigate to the custom form, select Team or Communication and then look for See other options in a tiny font at the top of the window.